Looking for the best online slots available to Australian casino players? Here we go! Top 10 pokies for 2019. If you like you to play the pokies, you must already know that it can be hard to keep up with what’s out there sometimes. You’ll find a new video slot that you like and play it for a few days, and then the next thing you know, five or ten new ones were released that you completely missed. Then it starts all over again. There are plenty of new titles, but you have no idea which ones are worth your time and the only thing you can do is try to play as many as possible to figure out which ones you like — if you like any of them at all. It can turn into a big waste of time, and sometimes money, going through all the new pokies that come out every week or every month just to find one or two that you’ll actually play regularly. For Australian casino players, it can be even more difficult. Many of the biggest pokie game designers don’t offer their games in Australia. That makes most of the news and new slot reviews on major gambling sites useless. Australian players don’t just need to know which new games are good, they need to know which new games are good that they can actually play. So this is for all of you Australian online pokie enthusiasts. This is a list made just for you. Following are ten of the best new pokies that Australian players should be looking for at their favourite online casinos in 2019. All of them are well worth the time to check out. We’re betting that at least a few of them will make it to the top of your favourites list. The Show Me The Mummy Pokie is a cartoonish video slot machine based loosely on the idea of the ancient Egyptian mummies. The game plays well, loads fast, and has big, bold symbols that are easy to see on any size screen. If you like comically designed pokies, you’ll most likely have a good time with this one. There are also several fun bonus features to help boost wins. Show Me The Mummy is a five-reel, three-row slot with five fixed pay lines. It features wild symbols, stacked wild mystery symbols with payout multipliers, free spins and more. It’s possible to win up to 20 free spins at a time and during free spins, only high-paying symbols appear on the reels. During the base game, either one or two reels can become wild mystery reels that will contain nothing but wild symbols with prize multipliers ranging from two times up to ten times. The West Town pokie from BGaming is the perfect video slot for those who enjoy old wild west style themes and even a bit of poker. The theme incorporates everything you’d expect to see in any of your favourite western movies. From guns and hard liquor to wanted posters and playing cards, it’s all there. Best of all, if you manage to shoot straight enough, you could win up to 5,000 times your bet. The graphics and animations on this pokie are all top quality. West Town is a five-reel, three-row slot where you can choose to play on one to nine pay lines. Free spins are triggered by a combination of the sheriff and wanted poster symbols along with a bandit symbol. You’ll get ten spins for every bandit on the screen when they land. In addition to the playing card symbols in the game, there’s also a joker, which acts as a wild for any of the other cards. If you manage to get a royal flush across the middle pay line, you’ll get a special bonus too. The Fruitbat Crazy pokie from Betsoft is a bright and colourful game that adds some fresh new twists to what we’re used to while paying tribute to the classic fruit machines that so many gamblers fell in love with. The overall design of the game is simple, but very well done. Symbols are crisp and clear and everything is easily visible even on small mobile phone screens. 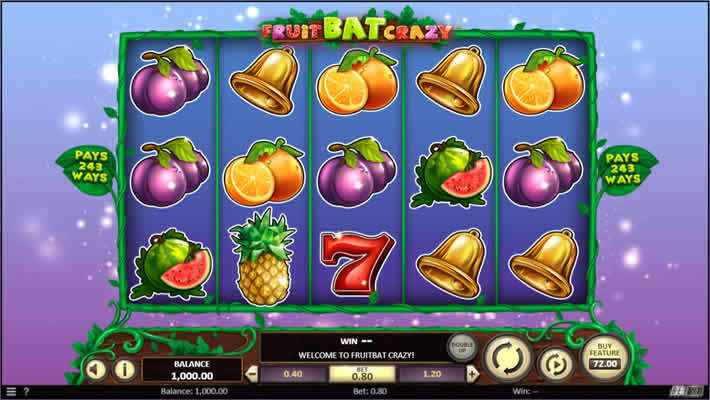 Fruitbat Crazy is a five-reel, three-row slot that uses the 243 ways to win payout system. Symbols on the reels include classic fruit, lucky 7, and golden bell symbols along with a wild diamond, and of course, the fruitbat. Symbols explode and cascade whenever there’s a win, creating chances for chains of successive wins. It’s also possible to win up to 200 free spins at once, which will surely pay off well. For those who like an extra bit of gamble in their game, there’s also a double or nothing feature available after any regular win. 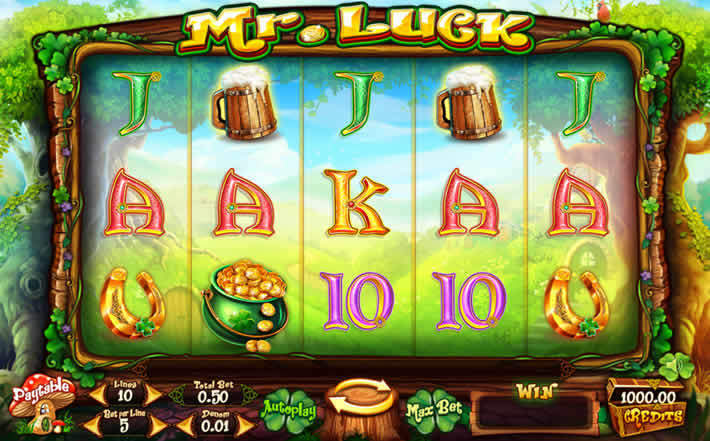 Mr. Luck is an Irish themed video slot from Felix Gaming. They’re known for their straightforward, fast-playing pokies and Mr. Luck doesn’t disappoint. The graphics and theme are full of lush greens and gold with the beer drinking leprechaun Mr. Luck taking centre stage. And don’t worry, Mr. Luck is not doing much to hide his pot of gold. Mr. Luck is a five-reel, three-row slot that will allow you to play anywhere from one to ten bet lines. Our happy leprechaun friend serves as the wild symbol on this game, and he’ll turn the entire reel wild whenever he lands. What’s more, he awards a free respin with wilds held in place, too. Land more than one wild and you’ll get more than one respin. Then, to really make sure the wins keep coming, this is one of the fairly rare pokies that pays both ways on the bet lines, so combinations from left to right or right to left will both win. 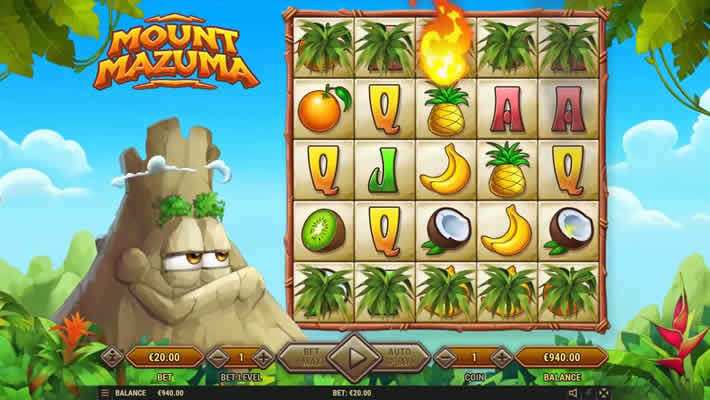 The Mount Mazuma pokie is a comical cartoon style slot that takes place on a tropical island with the smiling face of Mount Mazuma sitting off to the side waiting to explode and add some excitement to your game. This pokie looks straight and simple at first, but once you’ve played a few rounds you’ll see that things are not what they might seem and there is potential for some seriously big wins on these reels. Mount Mazuma starts out as a five-reel, three-row slot that pays based on the 243 ways to win system. Things can change, however, as you spin the reels. When Mount Mazuma blows his top, some symbol spaces will split in two and it’s also possible to expand any reel from three rows up to four or five. The end result is that as you play you’ll have a variable number of ways to win that can go from the starting 243 all the way up to a maximum of 100,000 with plenty of combinations in the middle. You never know what you’re going to get each time you spin the reels on this slot. One thing is certain, though. The potential for big payouts is huge. The Book Of Immortals pokie is loosely based on the ancient Egyptian gods. The overall visual design of this slot is sleek and beautifully done. Dark blues and purples blend seamlessly with contrasting, shining gold to give everything a strong, shining look. Everything is high definition and the animations are flawless. Book Of Immortals is another five-reel, three-row slot and all bets are made on ten fixed pay lines. Landing three or more scatter symbols will award ten free spins and up to 200 times your bet. During free spins, a special reel will appear at the top of the game which will select one of the symbols to expand and take over entire reels during free spins. A random feature can also activate on any spin that will change up to ten symbols on the reels to increase chances for big wins. The Reviving Love pokie revolves around the idea of a mad scientist trying to bring back his long lost true love — who also happens to be dead. This is a darkly amusing game with great graphics and animations that make it truly entertaining. There is plenty of potential for big wins and several different bonus features to help make sure you hit some of those wins. If you’re looking for some campy fun with a wild-eyed mad doctor, you’ve come to the right place. Reviving Love pays out based on the 243 ways to win system and plays on five reels with three rows of symbols. Landing scatter symbols will get you ten free spins. During free spins, any win will also grant you a free respin with winning symbols locked in place. Respins continue as long as new winning combinations are generated, so your actual number of free spins can be quite a bit more than just ten. Other bonus features can add a lot to your winnings as well. On any regular spin there’s a chance of anywhere from three to eight wild symbols being added to the reels. It’s also possible that a multiplier for up to five times your winning will randomly pop up as well. Then, in the biggest bonus game, you’ll have the chance to try to bring the doc’s late lost love back to life. The Sugar Skulls pokie theme is based on the symbolism of the Mexican Day of the Dead. The background is full of rich and colourful decoration and on the reels you’ll see several different skulls done up with the traditional makeup that marks the celebration. The game is fairly straightforward and simple, but plays fast and delivers good action for those that like to get to spinning and winning. Sugar Skulls uses five reels and three rows and you’ll be placing bets on 20 fixed pay lines. There are, of course, wild symbols as well as free spins. Free spins come in lots of ten and when you hit them and the reels change so that they only contain high paying and wild symbols. There is also the “Random Fiesta” award that triggers randomly in the base game. When it hits, your win on that spin will be multiplied by ten, 25, or 100 times. 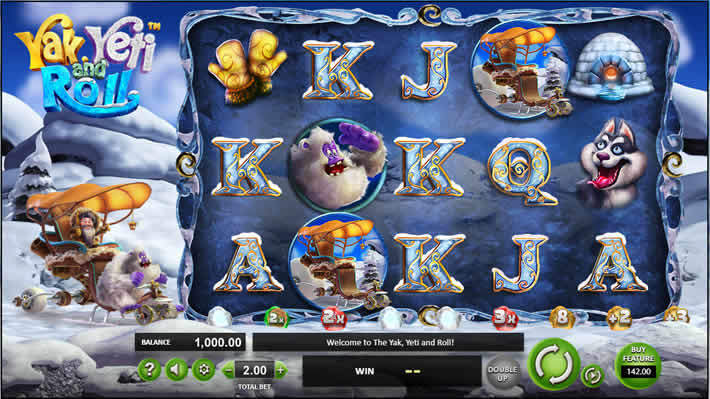 The Yak, Yeti & Roll pokie comes with a unique winter theme, some exciting gameplay mechanics, and plenty of big prizes to keep you going. The mythical yeti is here to help you boost your bankroll and with every spin of the reels he does his best to push you closer to the biggest prizes this slot has to offer. Once more, Yak, Yeti & Roll is a five-reel, three-row slot. Your bets will play on 20 fixed pay lines. This pokie awards bonuses in an unusual but exciting way. As you play, the yeti will advance in his sleigh along a trail at the bottom of the screen. With each winning spin, winning symbols are removed and a cascade of new symbols falls into place. With each cascade, the yeti moves one space forward, triggering new prizes. As he moves along the trail you’ll hit win multipliers, free spins, free spin multipliers, cash bonuses, and more. The father he moves along, the bigger and better the prizes you’ll get. Plus, they are all cumulative! The Presto! pokie brings to life a fun and entertaining magic theme. A dashing magician stands to the side of the reels in top hat and tails performing small tricks as you play. The symbols, characters, and animations all fit the theme perfectly and the execution is just excellent. There is always something going on somewhere on the screen, which definitely does a good job of holding one’s attention. 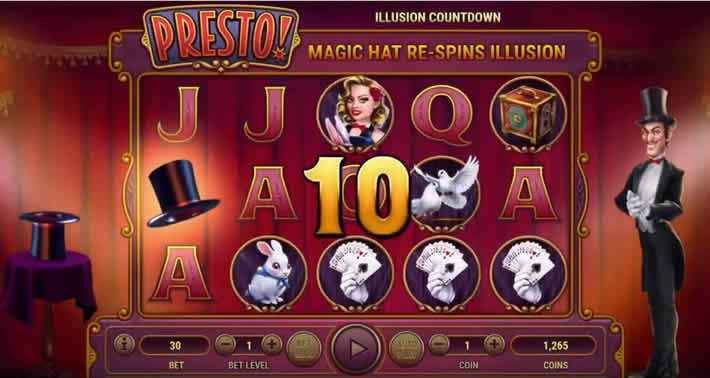 Presto is also a five-reel, three-row slot and makes use of the 243 ways payout system. It also pays out both ways on winning combinations, creating more chances to make winning matches. There are several different bonus features on this game, and one of the best things about this pokie is that you will see one of those bonus features with every ten spins you make. No waiting for scatter symbols, you’re guaranteed to hit a bonus feature every ten spins. You’ll see synced reels, expanding wilds, respins and free spins, and more.